This week finally saw the release of Panasonic's GX1, the company's much anticipated professional level compact system camera. Find out what else has been happing in the world of cameras with our weekly round-up, each complete with links to the full story. The GX1 is the big story of the week, having made its debut on Monday. It features a 16 megapixel sensor, high-speed focusing and what Panasonic claims is the fastest AF speed of any compact system camera. 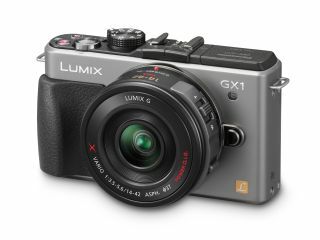 We were lucky enough to spend some time with the new camera, read our Panasonic GX1 Hands On Review to discover our initial impressions. If you've ever wondered why Panasonic decided to give this camera the X Factor, see Angela Nicholson's explanation of how the GX1 came to be. Not content with launching a CSC onto the market, the company has also debuted the Panasonic 3D1, the world's smallest 3D photo and 3D video camera which uses two lenses and even has the ability to record video and stills at the same time. The future isn't looking bright for Olympus, as yet more twists in the ongoing drama at the company were revealed this week. Not only has the Vice President been sacked amid findings that cover-ups at the company have been going on since 1990, but Tokyo Stock Exchange has warned that Olympus could be delisted if it fails to report earnings by December 14th. Keep watching for more on this story as it unfolds. If you'd like to take a look at the Canon EOS 1DX before it hits the shops next year, check out our hands-on review video where you can see it in action. The floods in Thailand are continuing to have an impact on camera manufacturers, including Nikon who has reported that operating profit is down by 25 billion yen. Nikon had previously hoped for record sales, due to a surge in camera purchases, but this now looks unlikely. It's more bad news as historic photography brand Kodak has sold its Image Sensor Solutions business to Platinum Equity, the division responsible for developing the very first digital camera sensor. Kodak is going through a difficult period, with losses said to be twice as bad as analysts had originally predicted. At the premium end of the scale, Leica is aiming to achieve a 1% global market share within the next 10 years. 1% might not seem like much, but compared with it's current 0.15% share, it would be a big jump. Leica announced on 7th November that it had enjoyed increased sales in the first half of the fiscal year 2011/12, following on from "record sales" in 2010-11. That's it for this week, join us again next week for all the latest camera happenings. If you'd like to share anything with us, don't forget you can follow us on Twitter, or join us over on our dedicated camera channel Facebook page.